Ah, the humble baby swaddle – so much good comes from a simple piece of fabric. We love a baby item that can do double duty, but the swaddle takes the cake, able to take its usefulness beyond wrapping a sleeping baby. Here’s our wrap (pardon the pun!) of eight clever uses for a baby swaddle. Ok, so we’re going to start at the most obvious. A swaddle is best used for swaddling a bub. That’s why it’s best to choose one that’s soft, easy to wash and durable – cotton and muslin are great options. Being beautiful helps too – there’s nothing cuter than a sweetly slumbering burrito babe. You’re likely to always have a swaddle within reach when you’ve got a baby, so just throw one over your shoulder at burp time. You can also use it to mop up any dribbles during a feed – bonus! Babies tend to need changing at the most inopportune times, but with a swaddle handy any flat surface can become a clean change area. They’re even great to use in public change rooms, just to keep a barrier between bub and the change table mat. Being lightweight and breathable means swaddles can easily be used to subdue a feeding baby just by tossing one over your shoulder and popping it over your baby’s head. No distractions, and if it’s sunny it doubles as some shelter from the rays. Speaking of the sun, it tends to keep little ones up when they’re trying to kip in their stroller. 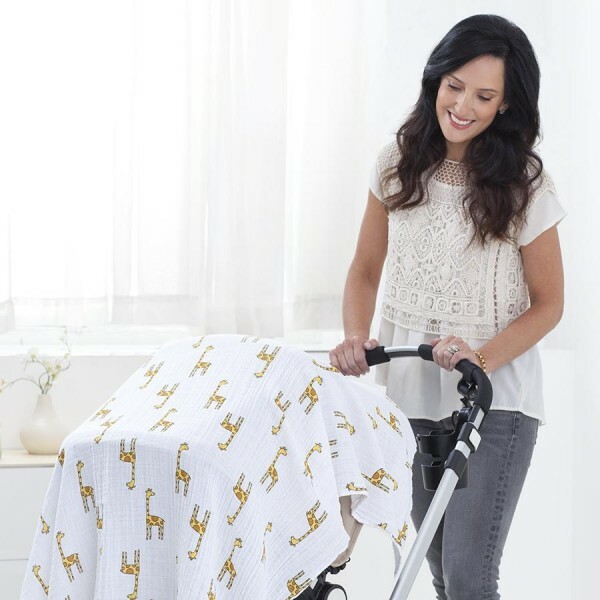 Loosely toss a muslin swaddle over the stroller (make sure the air can still circulate) and you have instant shade, and hopefully a sleeping baby! Ok, teeny babies won’t be doing much playing, but throw down a swaddle on a patch of grass in a shady spot and you have an instant tummy time corner while out and about. Genius! A baby takes real comfort from whatever is close while they are sleeping, so it’s only elementary that a swaddle is very likely to become your baby’s future blankie. It’s soft and cuddly – who wouldn’t be comforted by it! Forgot to pack a blanket for your walk? If you have a swaddle handy, just throw it over your baby’s legs in the stroller and hey presto – warm and toasty. A bamboo swaddle will keep them warm, without getting too hot. All hail the baby swaddle – make sure you never leave home without one (or two or three)!